Cube is a German company perhaps best known for mountain bikes but in fact also manufacturing an impressively wide range of electric bikes, all using the tried and tested Bosch motor system. They sell into more than sixty countries around the world so with that kind of global presence the Cube / Bosch combination should be one you can rely on, both for performance and after-sales backup. The Kathmandu Hybrid Pro 500 is a commuting and leisure bike – but a high performance one as it features the top of the line Bosch system, the Performance CX, which is more usually specced on high performing e-mtbs. So the Kathmandu should be a real performer up the very steepest of hills. This is reinforced by the 10 speed derailleur Shimano Deore gearing, its staggering 42 tooth helping give it an impressive 283% gear range and a seriously low bottom gear for the very steepest of hills. 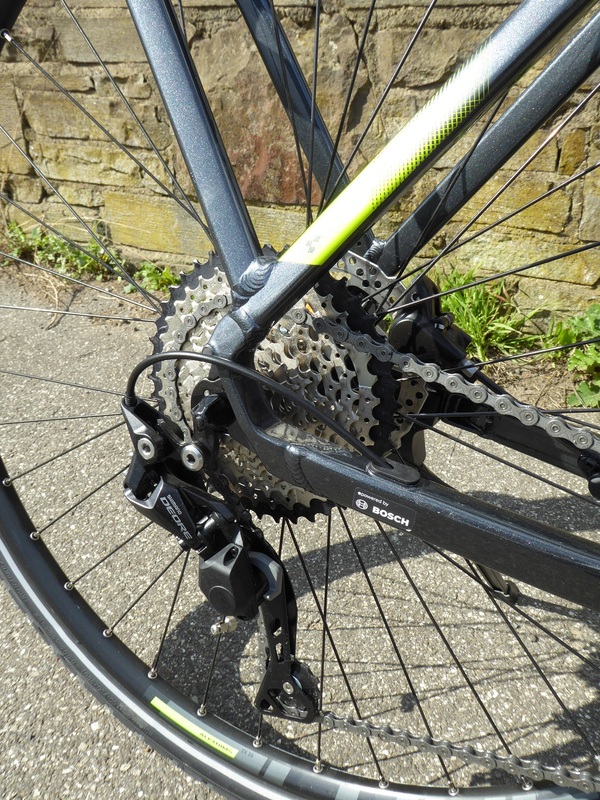 Braking is equally high performance – the Shimano BR-M315 hydraulic disc brakes are not particularly top of the range but have a great reputation as being super reliable and with plenty of stopping power (they are used on MTBs for example). In other respects its a very, very well-equipped e-bike with a stylish hydroformed frame sporting an integrated carrying rack and full accessories; mudguards, front chainguard, kickstand and very powerful battery operated Trelock LED lights. For rougher roads and forest tracks and canal towpaths the Schwalbe Range Cruiser tyres (with puncture protection) and Suntour front suspension complete the package. This is a sports coupe of a commuting machine. The gear changes are quick and the shift sensor cuts power for an instant whilst changing gear to allow the chain to skip smoothly to the next gear. It accelerates quickly up most hills to maximum speed and even on the very steepest hill we could find it (a 1 in 3 tarmac cycle path!) it exceeded 10mph. The great torque from the motor would also make it a good touring machine if you are going fully loaded on say a cycle camping trip (though in that case for all day riding you might want to consider an extra battery and perhaps a bit more of a padded seat). 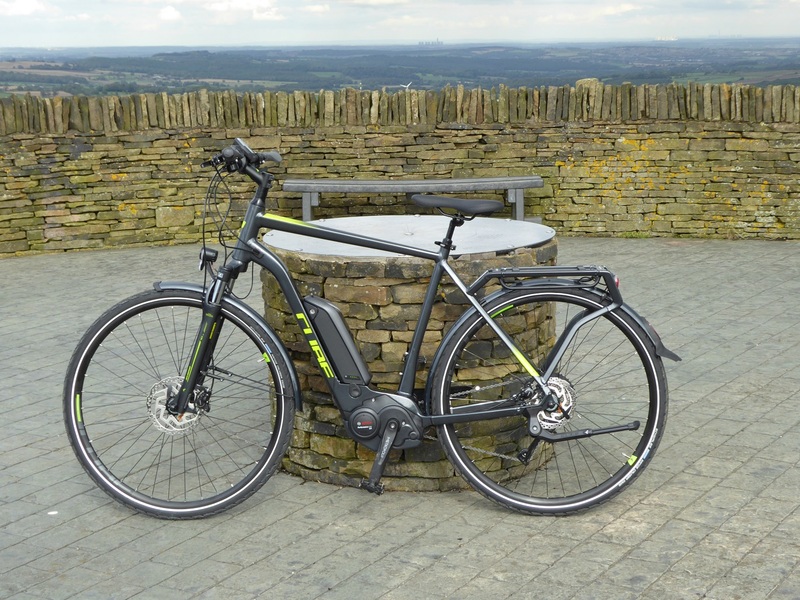 Our test also proved it to be a pretty efficient machine, managing around 12Wh per mile over hilly country – often using the top two power settings to get up steeper hills and giving a range or around 40 miles (that was for a rider of around 70kg with a lightly loaded pannier on board). If you want to see what range you might achieve check out Bosch’s handy range calculator. Using all power levels over hilly Pennine foothills commuting run with say 10kg pannier weight and 70kg rider. The excellent consumption figures probably came from a combination of an efficient crank motor, the close gearing of the 10 speed derailleurs and the wonderful Intuvia display (complexity-wise it falls between the minimalist Purion and the information loaded Nyon displays). The Intuvia is simple to use but gives a wealth of info, and the power indicator level helps you get the longest range out of your battery. This shows what level of assistance is being delivered to the motor. So for example it may tell you that switching to a different gear will use less electrical power with not a lot of difference to your speed or the difficulty of pedalling. 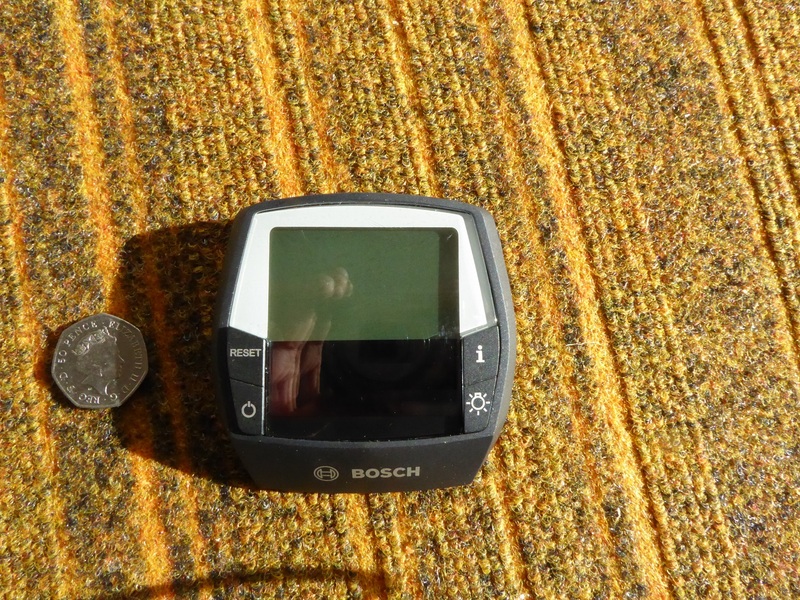 Other useful features include trip distance, odometer, trip time, clock and estimated range. The downside was the fact that the control buttons don’t light up on it (nor do they on the handlebar control power level button). However, all the buttons are nice and big and pretty easy to control with gloves on. The Intuiva display unit is also easily removable without tools and easily slips in a jacket pocket – a nice anti-theft feature. There aren’t that many ‘hybrid’ electric bikes out there with the Bosch Performance Line CX motor system (most feature the rather more sedate Active Line version) so the Kathmandu Hybrid is certainly a standout in this respect and for those wanting to combine leisure riding with performance and steep gradients and / or heavy loaded touring this is a stylish and very well-specced option.